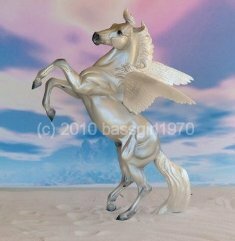 The 2007 Breyer Treasure Hunt brought us Pegasus or more whimsically, "Where in the World is Mystical Pegasus" using the Silver mold. While the treasure itself was a wonderful Pegasus model, the real treasures revealed where a few releases of a glossy charcoal and a glossy silver filigree that happened to be in mislabeled boxes. Courtesy of Belinda Kranz, photo of one such treasure in "magical" white.